De crisis in Jemen is immens. Hulporganisaties kunnen niet of nauwelijks ter plaatse komen in de rampgebieden. Het Rode Kruis doet een oproep via de website om steun te krijgen door een petitie te ondertekenen. Vanuit Nederland heeft rabbijn Awraham Soetendorp een oproep gedaan aan interreligieuze organisaties die tijdens de conferentie van de Parliament of the World’s Religions van 1 – 7 november jl. in Toronto bijeen waren, om de VS op te roepen zich verantwoordelijk te voelen voor een oplossing. 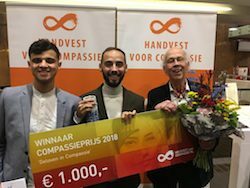 Vertegenwoordigers van Charter for Compassion, United Religions Initiative en Parliament of the World’s Religions hebben naar aanleiding van deze oproep onderstaande verklaring opgesteld en verspreid. Whereas, 14 million people, half of Yemen’s population face famine. It is estimated that 50,000 children have died in 2017, an average of 130 every day. More than three million Yemenis have left their homes and have become internal refugees. Another 280,000 have sought political asylum in other countries, including Djibouti and Somalia. According to the International interfaith organizations, specifically the Charter for Compassion team in Yemen, and United Religions Initiative (URI) Yemen programs, it is difficult to shelter internal refugees, find food and assist in keeping hospitals, clinics and mental hospitals operating. We the undersigned appeal to the US government whose military aid and soldiers are aiding Yemen forces backed by the United Arab Emirates and Saudi Arabia and the Iranian government who is aiding rebels to mutually agree to cease fire and provide a passage to international organizations to provide humanitarian aid to the civilians. We must add to the UN humanitarian chief’s statement to the Security Council that “there is a clear and present danger of an imminent and great big famine engulfing Yemen.” In addition, a generation of children has been denied education and the full population access to all forms of healthcare. We call upon the UN Security Council to immediately call for a cease-fire and the access to humanitarian aid. We implore both sides to commence a process of cease-fire and negotiation for the permanent resolution of Violence and the Conflict. Stop attacks on aid workers so they can work effectively. Allow humanitarian goods, especially food, medical supplies and basic needs such as clothing and blankets, to enter the country without restrictions. Allow schools to reopen so children continue their studies. Pursue a political solution to the conflict. Stop attacks on hospitals and civilians.